Charlie was purchased at the New Holland auction in Pennsylvania in December 2015. 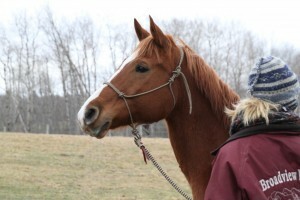 Unfortunately, as with most rescues, we do not have any history on this sweet horse. He had been through several auctions previously before coming to New Holland, but because he had no buyer, his fate was not looking good. Horses with Hope rescued Charlie and brought him back to the farm, along with Oreo. Shortly after Charlie started his retraining, we noticed he was a bit off on his right front foot. After x-rays, it was revealed that he has some slight navicular changes in his hoof. Because it was picked up early, his prognosis is good. We had our farrier put a 2° wedge pad under his shoes to alleviate some pressure on his heels. We kept his work schedule light and had him re-x rayed in a month. Under our vets advice, we increased the wedge pad to a 3° and gave him an injection similar to what is currently used in Osteoporosis patients. Charlie continues to improve and after another vet exam, his career outlook is promising. Since that time, he has already been brought back down to a 2° full wedge pad with continued farrier work. 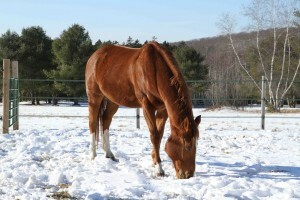 Charlie is 15.1hh and is approximately 11 years old. Charlie will not be able to be used as a competitive horse, as high impact work is not recommended for his condition. 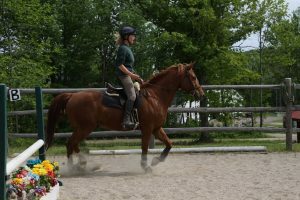 However, he can have a wonderful career doing flat work, trail riding and as a pleasure horse. He has a very friendly and playful personality and is a delight. Update: We are pleased to announce the adoption of Charlie. The Vincent's had always wanted to get back into horses. With the recent purchase of some property which included a barn and fenced pasture, they knew it was the right time. Charlie and Jackson seemed like they would be a great fit. They understood fully that Charlie would require special shoeing and periodic veterinarian follow up due to his navicular changes. Charlie was everything they had hoped for. He was calm, cool and collected…and a bit of a goof. While visiting Charlie, they also met Tommy. We explained Tommy’s challenges, and after the test rides, they announced they were also willing to take on and provide support for Tommy…and his anxiety. We are happy to say, Tommy’s uneasiness was already lessened due to the comfort of a familiar equine friend found in Charlie. Thats right, Charlie and Tommy were adopted together.